In Part 1 of The Italian Job, exiled-Blade Giacomo Squintani told of his work as a seventeen year old student, acting as a translator (and coach navigator!) for Sheffield United's Anglo Italian Cup ties back in 1994. As he now explains, that led on to other work behind the scenes at Bramall Lane thanks to a burgeoning friendship with the Blades' Promotions Manager - Mick Rooker. As well as running all the draws and raffles at the Lane and organising away days, one of Mick Rooker’s main jobs back then was looking after the Mascots (not “Captain Blade” – the proper mascots, the kiddies) on matchdays. 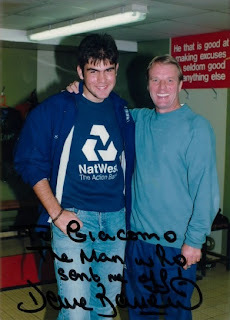 As a “thank you” for the Italian Job, he invited me to join him one evening – that’s when I had that photo taken with Bassett, which Mick then got Dave to sign “To Giacomo: The Man Who Sent Me Off”. Quality! Shame about the dress sense on my part, mind – or lack of. Failing to recognise the momentous nature of the occasion, I just threw on the first sweater I could find, some NatWest one that an uncle of mine had got through work. Had I known then that that photo would have adorned my mantelpieces for years, I would hardly have worn those colours! Anyway, that evening gave Mick an idea - always a dangerous thing! He asked me to help him out every matchday. I’d walk there around noon, he’d drop me off home after seven, and he’d pay me a fiver. It was a no-brainer! It was a no-brainer because it wasn’t about the money. Somehow I doubt SUFC ever paid NI contributions on that, and I’m not even sure it came out of petty cash. It probably just came out of Mick’s wallet, the “generous to a fault” bloke he is. As I said, I couldn’t care less about the money element, I had my AAA pass. I’d be in the home dressing room at 1:00pm every other Saturday, I’d see countless fathers accompany their kids and take a sneaky penalty in front of the Kop and I’d hear countless fathers comment that “it’s different when you’re stood here, with all those fans in front of you”. (and it truly is – my admiration for Matt Le Tissier soared as a result those Saturdays!) and, come five to three, looking after those kids meant walking out of the tunnel and on to the Bramall Lane pitch. Talk about living the dream! No matter how many times I saw the likes of Alan Kelly, Dane Whitehouse, Mitch Ward et al in the dressing room just before a match, or how many times we’d bump into Tony Currie, I never allowed myself to take it all for granted and allow that initial magic to wear off. For three years (I was on a four-year degree course and spent the third in France), I was like a kid in a sweet shop, albeit one with a stern, professional look. I never saw a first half, mind, as I’d be helping gather the numbers for the 50/50 Draw and other stuff in the Pools Office ahead of the half-time draws. After the game, once loose ends had been tidied up, Mick, his sidekick photographer (and top bloke) David Pye and I would end up in the sponsor’s lounge, by that point almost deserted but for a few buffet leftovers. They really did let all sorts in there… I sipped with blokes wearing long leather jackets (it says quite clearly “suit and tie”! ), with blokes with tattoos… Then again, when you’ve sold over 100 million albums worldwide or are a Hollywood star, you seem to get away with stuff like that. As for us, we’d just about get away with polishing off the curry, as a neat little stain on my tie still reminds me to this day. I’ve worn that tie at both of my English grandparents’ funerals, stain and all. I’m not buying another one! Top lad, our Mick. When in an unrelated tweet to @deanobri1968 I included the tag #mickrookerismyguru, his reply ended with “Mick is a legend”. Too right. I won’t bore you any further with specific incidents in my capacity as general dogsbody… hmmm, maybe just two, OK? “Can you go into the Man U dressing room and get Mark Hughes, he’s been voted Man of the Match”. And I did, I set foot into Man U’s dressing room and escorted Mark Hughes to the Sponsors’ Lounge. After all, we’re all human and maybe some egos are indeed inflated by how they appear (whether by their own choice or someone else’s) in the media. Last but not least – never underestimate the power that comes with a cheap paper badge and a logo! 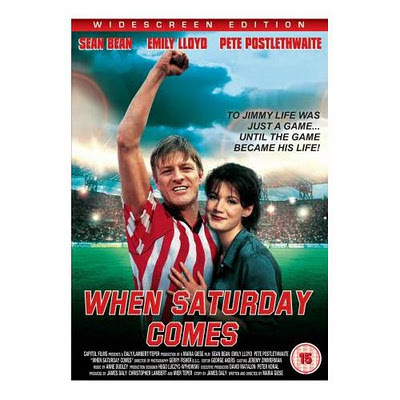 It’s hard to be objective about the movie “When Saturday Comes”. As a Blade, it’s a great storyline, and one that you are quite happy to have forced upon the world. But an FA Cup semi-final staged at home, with… well, I can’t even bring myself to type it, but you-know-who (Ian – For non-Blades and those who have not shared the magic of WSC, Mel Sterland ,the ex-Wednesday captain) as United captain.....all a bit odd, really. I was working on the evening of January 9th, 1995 when the Bramall Lane footage was filmed. Manchester United were the visitors (and, ultimately, conquerors) in an FA Cup 3rd Round tie and there was a real buzz in the ground. I was in the Pools Office and Mick Rooker shouted something across the room to me. I couldn’t hear a word (though there is a chance the sentence included any two from “Dego”, “chuff”, “dozey” and “git” – they usually did ), so I did what most people in an office would do and just smiled and nodded. I then proceeded to distribute three boxes’ worth of red and white balloons into the South Stand. and no, I never was offended. In true friendships, that’s par for the course. “You wazzock! I told thee they’d sent us one too many and I were gonna send it back!”. Walter John Downes, or as the world knows the bloke, ‘Wally’. And not without reason. To be fair, Wally can’t be too bad a coach. For starters, Dave Bassett appointed him, and that’s good enough in itself. And he’s carved out a decent career for himself, so he must be doing something right. Alas, I remember Wally mainly for our encounter at Bramall Lane in 1998. United used to hold (and presumably still do) a “back office” vs “coaching” staff match at the end of the season and I was blessed enough to be roped in for the 1998 fixture, even though I only really turned up to work once every other week. 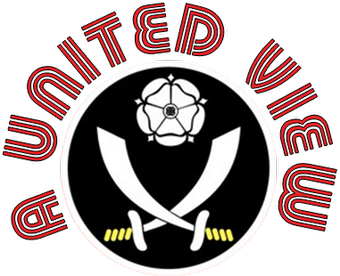 Yes, I had been playing for SUFC’s staff 5-a-side team, but that hardly did me any favours. I’m a decent enough ‘keeper, but we already had one of those, so I was just left to expose my lack of pace and stamina and indifferent technique. Well, the comments that were sent my way during and after matches were along those lines, anyway! 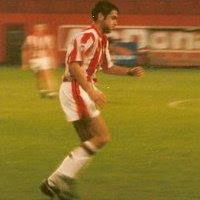 So back in May 1997 I actually got to walk out onto the Bramall Lane turf, wearing a red and white kit rather than a suit. I still find it hard to believe myself, so just as well I have photographic evidence. And good old Wally was opposite me for most of the game. I have no qualms in stating that I hardly gave Wally a run for his money that evening; he was a former pro and I was an unfit University student. Yet, for some reason, he couldn’t resist ‘sledging’ me throughout the entire game. It’s a bit like a former County cricketer hitting an amateur bowler for consecutive boundaries and bragging about it. Then, at one point, a loose ball flew our way. It was me vs Wally, height being my sole area of advantage. I leapt into the air, seemingly hanging in there forever (or so it felt) and headed the ball back from whence it came. It was a move that entailed no skill, no fitness, just the ability to jump and make contact with a relatively big white sphere. Wally looked devastated; for me, that still ranks as the highlight of all the time I’ve wasted playing football. So, there you have it – a few tales from the days when I lived the dream. The £5 per day dream! Thank you for taking the time to read them.